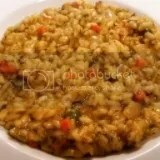 Risotto is one of those dishes that you love to hate. Not so much in the dining and devouring part…but the making of said dish. Don’t get me wrong, I am a risotto fanatic as much as the next person, however…I much prefer the unorthodox way of cooking it…in a dutch oven…in the oven. Baked. Stovetop…just never seems to want to work out fright for me. That being said, back in my April (Spring) 2015 Cuisine Cube, I received a package of risotto from Bountiful Pantry’s gluten free selection. I was pretty stoked. Gotta love risotto. I couldn’t wait to find a night to cook it up. And then…I just never got around to it. With everything that was going on with my hip injury, recovery, broken leg, travel, more travel, more recovery, the holidays…it’s been pretty non-stop since I received this box in the mail. Thankfully, it was good through April of 2016…so it wasn’t a waste. Before I get into the product itself…here’s a little bit about Cuisine Cube. Cuisine Cube is a subscription service that delivers 5-6 gluten-free, full-size products to your door for as little as $34.99/month. Inside the cube, you will discover full-size products (not sample sizes) that are made by local and smaller, artisan companies, rather than those that you can find at the average grocery store. It has introduced me to so many new and delightful products. Each box contains a breakfast, lunch, dinner, snack, and dessert product…and then, sometimes, an extra bonus item. Who doesn’t love a little something extra, right? Keep in mind, however, that Cuisine Cube has gone through some changes as of May. No longer do they strictly only offer gluten-free cubes. In addition to their gluten-free option, they now also offer Artisan and Vegan cubes as well. The Artisan cube means that you have no food allergies and foods that contain common food allergens will be included. The Vegan cubes contain products that are dairy and animal free. And, they still have the Gluten Free cubes, which will have products that contain no gluten or wheat. So, if you’re really interested in being introduced to the smaller, lesser-known, artisan companies, give Cuisine Cube a try! It’s like…Christmas…or your birthday…every month! Who doesn’t love that?! I did love it and I hope I’m able to resubscribe soon. The dinner feature in the April (Spring) 2015 Cuisine Cube was the Bountiful Pantry Risotto with Garden Vegetables. Bountiful Pantry is best known for their healthy, easy-to-prepare, and delicious mixes ranging from appetizers, to soups, to salads, to dips, to stews, to chilies, to chowders, and various sides, among other things. Inspiration for their mixes stem from their home on the island of Nantucket, where the often cool, damp weather would inspire the desire for an inviting pot of soup. By starting with family favorites and classic New England favorites, Bountiful Pantry has created delicious and satisfying recipes that are easy to share. Since the creators follow a healthy, low-sodium diet, focusing on taste, they are seeking and finding new ways to pack flavor into their mixes using a variety of vegetables, herbs, and spices. They use the finest all-natural ingredients, including vegetables picked and dried at their peak of freshness. There are no preservatives, added salt of MSG in their mixes, and they are gluten free as well. Even better, meals can be prepared in as little as 30 minutes. Gotta love that. Well, this weekend seemed like the ideal time to cook up a risotto because Sundays I’m usually batch cooking anyway. And as I’m working on clearing out my pantry, this was a logical choice. And I was pretty excited about it too. Because…risotto!! The only thing I wasn’t excited about was cooking it. But, no worries, it’s super easy. I first heated up 5 cups of vegetable broth. Then, I melted 4 tablespoons of vegan butter (Earth Balance) in a pan. Once it was melted, I added chopped onion and let it soften to the point of translucency. I took 1 cup of the broth and put it in a bowl with the dried vegetables and let it soak. Then, in went the rice to the skillet with the butter and onion. I gave it a stir to coat it all. And then…the long and tedious task of adding 1/2 cup broth and stirring began. Each time more broth went in, the rice would begin to plump up more and more. And when the broth was gone…and my rice was still a little crunchy…in went water until I got that perfect rice consistency. Then, the vegan parmesan cheese and 1/2 cup of white wine went in. More stirring…and then…dinner was served. With a glass of the white wine I used in the risotto. Just sayin’. The Bountiful Pantry Risotto with Garden Vegetables was amazing. Creamy and rich. The vegan parmesan really enriched the flavor and texture, bringing it to that perfect risotto consistency. The Arborio rice took a little longer to cook, but once it got to the proper texture…it was a fantastic dish to devour indeed. There is, naturally, an option to serve this as a side dish, but my roommate and I chose it for our dinner, so we took 4 servings of it instead of 8…having leftovers for lunch later this week. And I can’t be more excited about having it again. I loved how perfectly this cooked up, and despite having to add a bit of water, it got to that perfect rich and creamy consistency and the flavor…was spot on. The vegetables softened up and the seasonings perfectly added to the taste, no added salt or anything. Perfection. And all in a bag, ready to go. So, what all is in the Bountiful Pantry Risotto with Garden Vegetables? Nine ingredients. Yes…just nine. They are: Arborio rice, peas, carrot, corn, onion, tarragon, chervil, parsley, and chives. This mix is gluten-free, non-GMO, no MSG, and no added salt or preservatives. This product is certified by the Celiac Sprue Association. As for nutritional information for the Bountiful Pantry Risotto with Garden Vegetables…this isn’t bad. Even when you add in the butter, onion, cheese, veggie broth and wine, it is reasonable for risotto. A serving of the dry mix is 1/4 cup (51 grams) and there are 8 servings per package. In each serving, you will be consuming 170 calories, 0.5 grams fat, 0 grams saturated fat, 0 grams trans fat, 0 mg cholesterol, 10 mg sodium, 40 grams carbohydrates, 2 grams fiber, 1 gram sugars, and 4 grams protein. Not bad at all. If you love decadent, rich, creamy and and flavorful risotto…why do it all from scratch yourself? 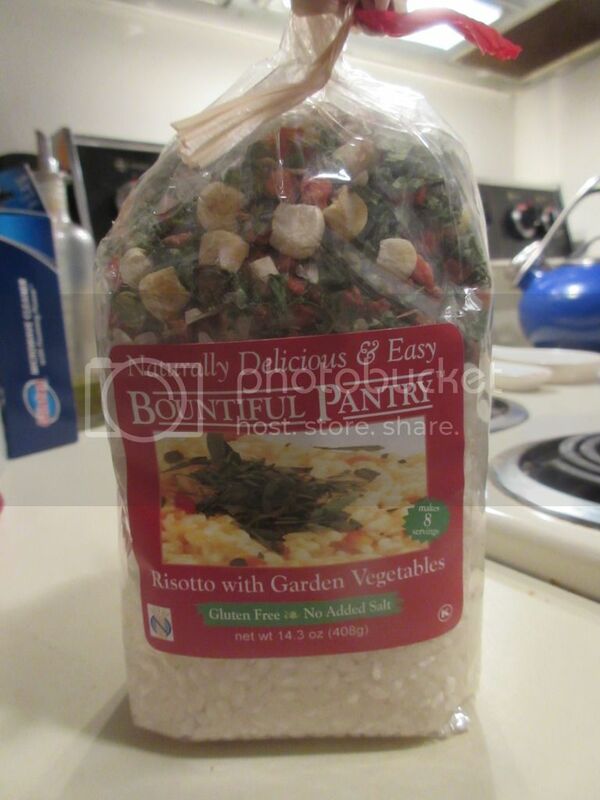 Bountiful Pantry helps make it a little easier with their package of Risotto with Garden Vegetables. Big flavor. Big eats. It was amazing from the first bite to the last. My roommate and I probably could have eaten the entire pan if I hadn’t set the rest of it aside for lunches. It’s that good. So, head over to Bountiful Pantry‘s Web site and place an order for one of their numerous mixes. But, if nothing else, try the risotto. This entry was posted in Cheese, Clean Eating, Cuisine Cube, Entree, Food, Gluten-Free, Italian, Mix, Products, Review, Rice, Side Dish, Vegan, Vegetables, Vegetarian by The Celiathlete. Bookmark the permalink.